Nose was always blocked with lots of mucus. Right and left shoulders would be experiencing lots of pain. Neck on the right and middle – excruciating pain and when I turned I was feeling the “crunchy” sensation and it stiffened up at most times. Sternum – stabbing pain, usually for about a couple of hours each time and went on for the whole day occasionally. Rib cage – cramped up severely for 4 to 5 minutes when it was turned (every time0. Thoracic vertebrae (middle) felt “crunchy” constantly. Lumbar region – lots of pain and discomfort and when bending over – would also have to sleep on my side and then the pelvic region started to flare up after an hour sleeping in that position and would have to change to the other side of the pelvis. Acid reflux – lasted for 10 minutes when occurred. Thigh – right and left had severe spasm and sciatic nerve pain that would come at the same time usually when kneeling down for a long time and worsened with a car accident in 2011 (last year). Left thigh would worsen and flare up even more than on the right thigh and knee. The left knee fracture took place many years ago (before the 2011 car accident). Knee cap- (left) would be impossible to bend and felt the numbing pain after kneeling for an hour. Heel – (left) hurt quite a bit and together with the weak achilles – tendons and ligaments it was quite bruised from years of not getting the proper treatments. After about 3rd to the 4th massage treatments, huge amount of mucus collected in the nasal passage and then had gone away almost completely. The “crunchiness” and severe pain on the nape-of –neck area were gone. The shoulder pain had reduced to almost nothing and the mobility returned. Same improvement came back on the sternum. After about 4th to the 5th massage treatments, rib cage and the middle thoracic vertebrae pain had reduced tremendously from the rate of 9 out of 10 (for pain level). Around this time the sciatic nerve problem had also reduced tremendously. The left knee cap severe pain and immobility had also healed up quite completely from a rate of 9 out of 10. I want to thank you for your work to help relieve my back pain. I have been experiencing back pain off and on for the past 15 years. I tried various methods such as hot packs, cold packs and back massagers. None of that worked. However, when I met Gracie, she mentioned about deep tissue pressure massage and finger manipulation. I won’t go into further details about it, but it worked. At first, I felt a little tender pain in the part of my body where she worked. After a few days, I felt a tremendous difference. It was amazing the back pain I had a few days prior was gone. Usually it took weeks and months for the pain to dissipate. Gracie, I want to thank you so much, I highly recommend her to anyone who has joint or back pain. Give her a try! “I play a couple of physical sports throughout the year and have been suffering lower back pain for over 20 years. I have been to several chiropractors over the years that offered temporary relief but never complete relief. 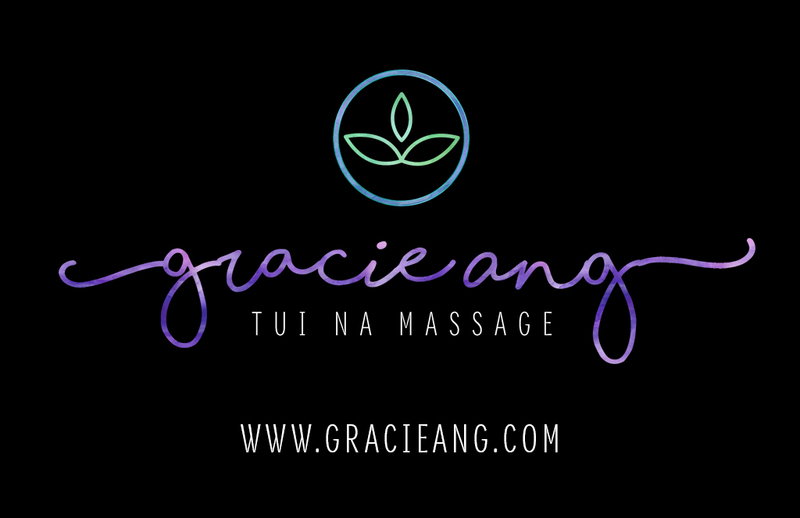 I was referred to Gracie Ang, proprietor of Gracie Ang Tui Na Deep Tissue Massage Practice by a fellow teammate. The deep tissue massage that the practitioner provided was painful at first, as discussed in my initial consultation but after three (3) treatments, the lower back pain extremely subsided. Currently I perform the recommended stretches by her on a daily basis and now visit Gracie Ang Tui Massage Practice every 3 months or so for maintenance. I am a computer software engineer and have had neck and upper back problems for about 10 years. The problems are: tension, headache and lassitude. All other massages gave me only temporary relief, only Gracie managed to help me by providing and achieving permanent result. After the third visit I totally recovered. At present, I am going for treatment about once in every 3 months or so and feel myself so much relief as I have never felt before for the last 10 years. Before consulting Gracie and taking consultation with her Tui Na Deep Tissue Massage Practice, I suffered severe pain on my lumbar region – spasm for many decades; the recent tingling, pinching and numbness of my left palm; gaseous abdominal problem; diarrhea; urinary bladder problem for many years; hypertension with my blood shot eyes and past chest pain. Well, from Gracie’s medical record I got pretty outstanding result within the fourth to the fifth treatment for all these health issues and at the same time she helped me with my smoking addiction and it was pretty well managed and under control. Gracie Ang’s Tui Na deep tissue massage is the best massage that I’ve ever had. I came to see Gracie for treatment of upper back pain and rotator cuff pain. She has the ability to zero in on the knotted muscles and work out the knots. She focused on the sore muscles and very quickly helped me get rid of the pain and get the mobility back in my shoulder. I highly recommend Gracie’s 3-Step Massage Treatment to anyone experiencing muscle pain.